An unidentified gunman opened fire at a bar in Southern California Wednesday night. At least 12 victims have been reported dead, and at least a dozen others injured. A law enforcement officer and the suspected gunman are among the dead. A gunmen opened fire at a southern California bar Wednesday night, killing at least 12 and leaving at least a dozen others injured. 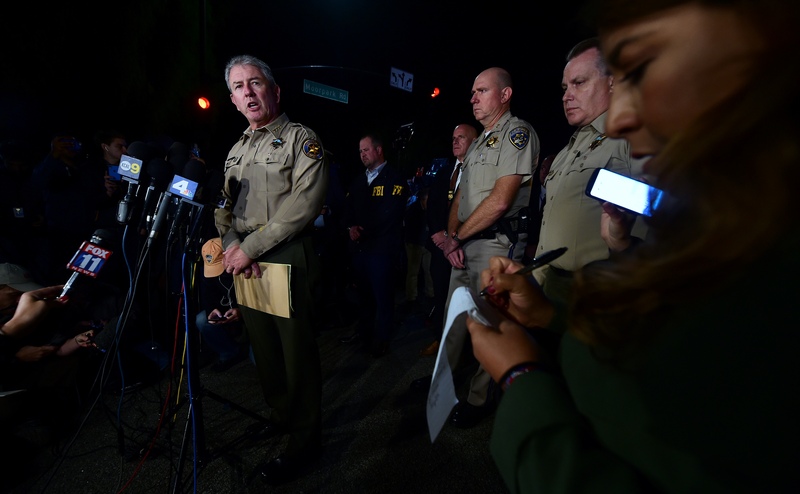 A Ventura County sheriff’s deputy is among the dead, police say, as well as the suspected shooter, who has yet to be identified. President Donald Trump has been “fully briefed” on the situation, and tweeted Thursday morning, thanking the victims and law enforcement for their bravery. “God bless all of the victims and families of the victims. Thank you to Law Enforcement,” the president tweeted. “It’s a horrific scene in there, there is blood everywhere and the suspect is part of that, and I didn’t want to get that close and disturb the scene and possibly disturb the investigation,” Dean told CNN. Sgt. Ron Helus, a 29-year law enforcement veteran, was one of the first law enforcement officers on the scene. He was shot and died early Thursday morning in the hospital, according to the Ventura County Sheriff’s Department. Dean, choking back tears, said Helus undoubtedly saved lives by being the first to confront the gunman. Helus leaves behind a wife and son, whom he called before entering the bar. Witnesses told ABC News that after the gunman fired several shots, he tossed what appeared to be smoke bombs around the bar and began shooting again. A promoter for the bar, 21-year-old Taylor von Molt, also said in an interview with CNN that she thought the gunfire sound was just balloons popping. “[…] it’s a country bar so we were line dancing … and I heard what I thought was a balloon pop,” von Molt said. “I was confused because we didn’t have any balloons at the time … I turned around and saw him fire his weapon a couple of times and I ran to the nearest exit and tripped and fell on the way,” she added. Police told the Los Angeles Times that at least 30 shots were fired. “It doesn’t matter how safe your community is, it doesn’t matter how low your crime rate is – there are people who just don’t think properly everywhere, I don’t care where you are, and they commit horrific acts like this,” Dean said. The Ventura County sheriff said authorities are unsure of a motive, but said there are no links to terrorism. An additional 18 victims were injured, but not shot, while trying to flee the scene are being treated at area hospitals, according to Ventura County Fire Department Capt. Stan Ziegler. Many of the victims inside the bar were young students at nearby schools, including California Lutheran University and Pepperdine University. “I’m embarrassed to say … my first thought was, ‘here we go again, it’s this week’s mass shooting,’ and that’s a really hard way to think about this. I contrast where we are today with how we all felt about Sandy Hook,” Himes said. “This is a weekly thing [and] even though it’s become a weekly thing, nobody does anything, especially the Congress where I work,” the congressman added. This is a developing story, and more updates will be provided.